When Emily Starr’s beloved father dies, she’s sent to live with her distant relatives at New Moon, where she isn’t loved and doesn’t belong. But Emily slowly finds friends in Ilse, Teddy, and Perry, and begins to feel that maybe she can love New Moon after all. 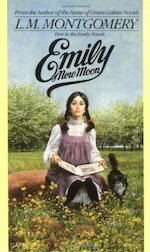 Emily of New Moon is a wonderful book for any budding writer (age 7 and up). Emily Climbs and Emily’s Quest deal with more mature themes of love and marriage (age 9 and up).